A Canadian dog owner is making headlines today for the touching act of kindness he showed his dying dog — a final meal most humans would envy. Josh Lawrence’s beloved 8-year-old Boxer, Lennox, was diagnosed with severe arthritis and cancer. The bad news was tough for Lawrence. After numerous surgeries and treatments, Lennox’s condition did not improve. When Lennox developed a large and painful tumor on his shoulder that made it hard for him to even stand, Lawrence knew it was time to make the difficult decision to end his best friend’s suffering. But Lawrence wanted to give his dog one final gift before saying goodbye — the dinner of Lennox’s dreams. 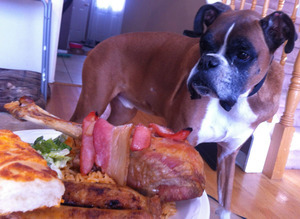 Lawrence prepared a huge plate of all the people food Lennox could ever crave, including rice, greens, cheese bread, sausages, and the pièce de résistance — a giant turkey leg wrapped in bacon. Lawrence’s roommate and Lennox’s buddy, Niko Grosdanis, decided to share the story of the dog’s epic feast on the popular site Reddit. Under the username “Nikolaoss,” Grosdanis posted a touching photo of Lennox surveying his last meal, a meal that is certainly fit for a king. The photo has earned nearly 25,000 “up votes” on the site since it was uploaded earlier this week. “This post isn’t meant to be sad in any way,” Grosdanis writes. Grosdanis followed with a video of Lennox indulging in the spread. In the video, Lennox struggles to his feet, then waddles over to enjoy the special meal. The touching video of Lennox’s last meal has officially gone viral, earning over 140,000 views on YouTube in less than a week. “He was always a social dog that everyone loved,” Grosdanis remembers of Lennox. And the love just keeps on coming, with Reddit users posting by the dozens. Some have posted their condolences, and others share their own stories of losing a pet. “One of the greatest lessons a pet teaches its owner in life is that it ends,” one Reddit commenter poignantly states. After his feast, Lennox enjoyed visiting with his other doggy friends and went on one last walk before Lawrence drove him to the veterinarian’s office. Lennox passed away peacefully the afternoon of January 23. But for Lawrence and Grosdanis, the memory of their buddy Lennox will live on, and they are thankful to have so many photographs and videos to remember him by — especially the ones of Lennox’s last day. “I was just really happy that he could still be such a big part of my life even when he’s not here,” Lawrence said.